Welcome to the first of two articles about Staedtler at the Insights X 2016. 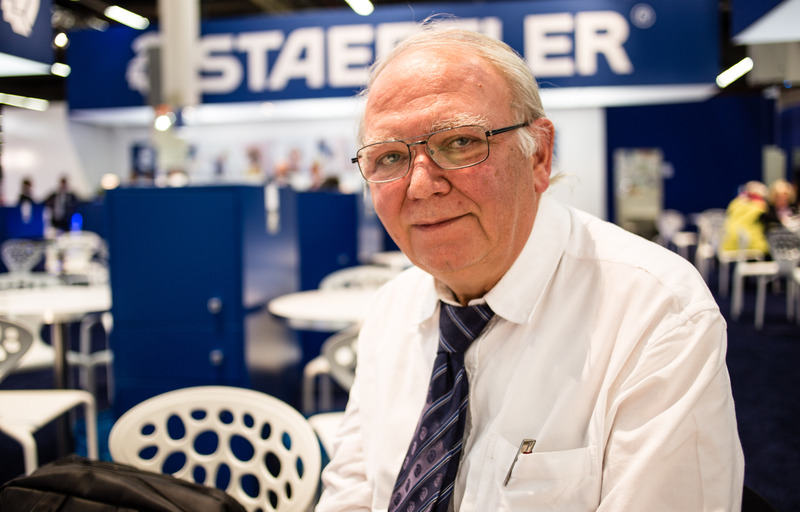 This one is looking at one of the great minds working at Staedtler: Helmut Hufnagl. Helmut Hufnagl loves to solve problems. Wopex pencils have a different material, so sharpeners don’t work well with them? No problem, Mr Hufnagl comes up with a Wopex optimised handheld sharpener as well as the crank sharpener 501 180. Normal rulers are created for right-handed people, so left handed people might struggle with them? No problem, Mr Hufnagl comes up with new rulers that are equally suited for right and left handed users. Sharpeners make a mess in the pencil case? No problem, Mr Hufnagl comes up with a sharpener that won’t leave bits of wood and graphite all over the pencil case anymore. For 2017 he also came up with a new set of compasses that convey the idea of geometry through basic geometric forms and that convey the idea of colour through a special paint and a new set of metallic coloured sharpeners. ..but the best one is yet to come and it reminds me of a story I read many years ago about Adi Dassler, the boss of a German sports shoes and clothing manufacturer, who is also from the Nuremberg area. Not only did he equip Jesse Owens who went on to win four gold medals, he once watched the Olympic Games on his telly from his home in Bavaria and noticed that one of the athletes at the Olympic Games in Montreal 1976 was running unevenly. He advised over the phone how to adjust the shoes and Alberto Juantorena, the athlete we saw on telly, went on to win two medals. Well, Mr Hufnagl’s story is quite similar. He spotted a problem in another part of the world when he was reading an article in Wall Street Journal about his favourite designer, Giorgetto Giugiaro, the man who designed the original VW Golf, the DeLorean (Back to the Future), the Lotus Esprit (James Bond – The Spy Who Loved me) and many many more. I can’t live without my blue Staedtler pencils. I use the pencils with the hardest lead when I have to draw the most precise contours, and softer leads for drawing shadows or for 3-D effects. When I draw one-to-one scale figurines, I prefer charcoal pencils and chalks. The article also features a photo of Mr Giugiaro’s Staedtler ‘pencil’ – it has a beige mark, presumably to indicate which type of lead is in the lead holder. This is where Mr Hufnagl realised that it is easy to help Mr Giugiaro and others by introducing a lead hardness indicator. This was the birth of a classic with a new twist, the Mars technico 780C with a lead hardness indicator that can bet set to 4H, 2H, H, HB, B, 2B, 4B, red and blue by twisting the clip. I find it amazing how a simple idea can improve a tool that has been around for decades. 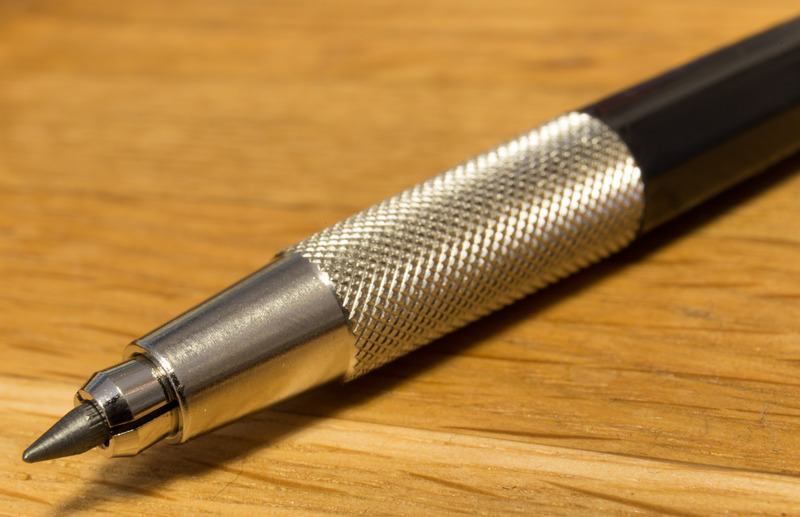 The special black edition of this lead holder, pictured here, is being released at the same time as the traditional blue version gets the lead grade indicator update. The new lead hardness or lead grade indicator is probably especially useful if you don’t use Staedtler leads. If you buy the original leads each different grade is supplied with a different colour replacement push button (they are however only push buttons, the lead holder comes with a more useful push button that doubles as a pointer/sharpener). This is not being mentioned on the Staedtler web site, but you can find this information in the comments on Dave’s Mechanical Pencils, on the Cult Pens web site or in Pen Paper Pencil’s review of the lead holder. Mr Hufnagl is changing his role within Staedtler, he stopped working as a Product Manager in the area of sharpeners and technical drawing and has started his new role as Head of Trade Marketing. I hope he will still have an opportunity to develop new products in his new role. Google also lists a patent with his name on. I believe that showing the image from the Wall Street Journal in this blog post falls under “fair dealing” as described by the UK Copyright service. Fascinating! I am really enjoying your pieces from Insight, thanks for sharing them. Your posts have more content and style than most ‘journalists’ who write professionally, not to mention what serves as standard fare on many-a-monetized ‘stationery’ blog. Including photos of your subjects is brilliant, and speaking for myself, draws me even further into the story. Matthias, this is fantastic! I agree with Sean. This is something I would also love to find in a book because it doesn’t celebrate a passing stationery fever but is also worth reading many years from now. Thank you! which sharpener does he mean… that one that doesnt make a mess in the pencil case? i know this noris sharpeners…. and they make a mess. graphit comes out all the time. or did he mean a different sharpener? John, there’ll be a few more, but Super5 and Staedtler were IMHO most interesting. I wish I’d have had more time, to go to KUM and Koh-I-Noor and look more at Faber-Castell. Sean, I was worried it sounds like advertising, because it isn’t critical. I’m very happy to hear that this is not the case. Unfortunately the most interesting stuff is covered already, so don’t expect too much from the following Insights X posts. Gunther, I wonder how many other great minds work at Staedtler, Faber-Castell and the other companies. I’d love to know more about the story behind the products – it’s a shame that stationery companies don’t let more of this information out – probably not because it’s secret, but because they think people aren’t interested. Marvin, I’ll write more about this sharpener in the ext blog post. It’s a container sharpener with a lid, just small enough to fit in the holder of a zipped pencil case.